Our Enduro tours across the stunning Sardinian territory are designed to meet the needs of everyone. We have selected different technical degrees routes that will suit any level of riding ability. 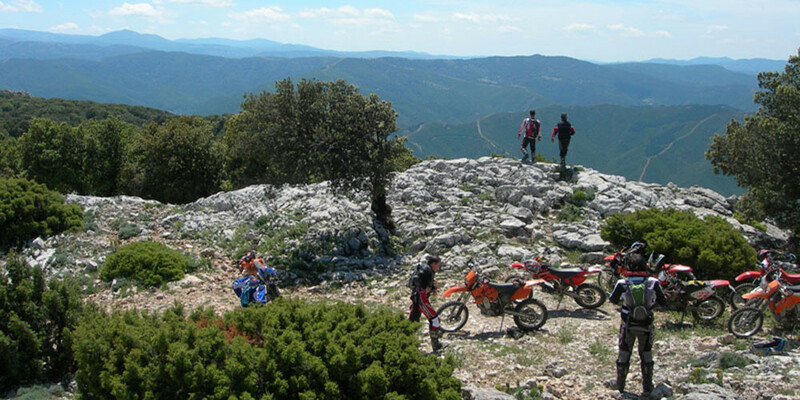 Enduro tours cover various areas of the island (Barbagia, Ogliastra, Gallura, Sulcis etc.) and may have different characteristics. It is possible to live a different experience on each tour, exploring new routes and landscapes and discovering many aspects of the traditional cuisine and Sardinian folklore. Mixed off-road/on-road paths that can be ridden with Maxienduro touring bikes with the possibility to travel with a passenger on board. All sections are "in-line", starting and finishing each day in different places (we'll take care of the luggage). Unique base location, each stage will have a circular route starting and finishing in the same place. Includes "Fix-base" and "in-line" stages. Groups can customize their tour by choosing the dates, areas, degree of difficulty and all the other tour details. Drivers that are not part of a group can choose the most suitable solution from our "Organized Tour". The tour in its four days have a total length of about 650 km and will pass through picturesque places and scenery of unusual beauty. The tour will be held from December 29, 2015 to January 3, 2016 and provides a walk-through of about 900 Km (80% off-road) divided into six stages.